In this webinar, Stephen Smith provides critical industry insight for ABA professionals and healthcare organizations. “Essentials for Successful ABA Professionals and Best Practices” has been designed to assist in navigating HIPAA administration, and understanding its impact on every healthcare organization. From implementation of policies to maintenance and compliance, Stephen explains the importance of well developed tools and systems every organization needs. 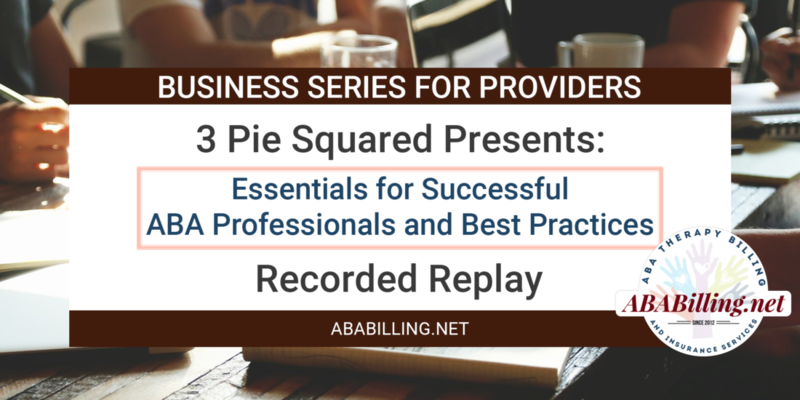 About 3 Pie Squared: Whether you are looking to create handbooks, or overcome the obstacles that exist with hiring and retention, or even just starting your practice, 3 Pie Squared has the understanding, expertise and resources that will guide you and your organization every step of the way. This webinar is FREE through Thanksgiving!